Most of our task lists are actually outlines. Which in turn are mini project plans. The reason for this is that seldom can we just say in a single line what a whole task is. Usually, a task requires sub items to be completed as a part of the whole. The better outline app let you re-do the order that tasks appear since as a project unfolds things can change. A outliner app we have recently been putting through testing is Cloud Outliner. This universal app has a slightly different layout depending if you load it on your iPad, iPhone or iPod Touch. 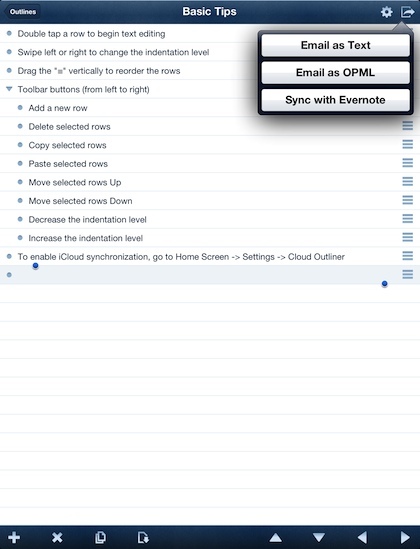 Buy once and keep your lists in sync across all of your iOS devices. Projects can be set up in a sortable (drag n drop) overall list. Tap one to drill down to your hierarchical tasks list. Tap a blank line to add a new task or use the ‘+’ along the bottom of the screen. The ‘X’ button deletes a line (dragging the task to the right does not work to remove a task but does work on a full project). Selected line item(s) can be copy/pasted for quicker list building. Line items can be moved up and down the list by using the buttons at the bottom of the screen or the drag bar to the right of each line. Arrows also control the depth of each line to make a line a sub of another. Since everything we do can’t live only on our iPads, sharing is done via an email export as text or a OPML (allows the list to be opened in other outline apps). Exporting to your Evernote account is also supported. 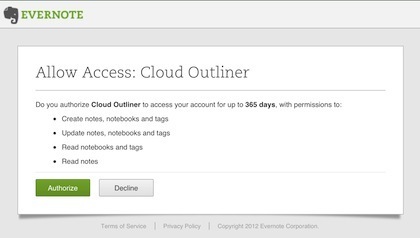 You have to allow Cloud Outliner to have access to your Evernote account beyond a simple save. Although the example shown at the beginning of this post is just a list to work through. Cloud Outliner does support checkboxes so you can check off items as they are completed. There is an option to show/hide the completed items depending on how you work best. As the name implies, Cloud Outliner does allow the sync, storage and sharing of your outlines through iCloud. Be warned, the set up isn’t through the app or app settings though. 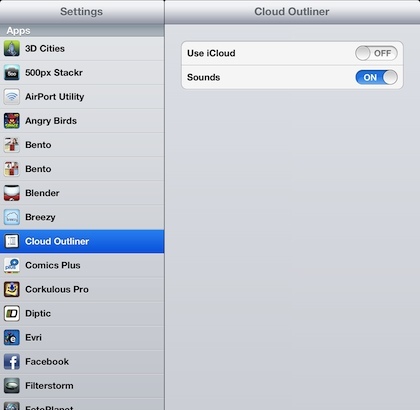 You have to go to your iPad’s Settings ‘app’, then scroll down and select Cloud Outliner to turn on the iCloud connection.